Great jacket for a reasonable price. Has adjustable waist and arms to meet maximum comfort, will keep you very warm in cold conditions - used it in conditions as low as 10° and I didn't even realise it was cold. Go a size up but great "all round " jacket. Price and quality to match.....bonus of FREE trousers.....why get anything else ! I was seeking a red jacket to go with my red bike and there is a limited choice but this jacket fitted the bill. It has a removable quilt lining and four vent zips. To date it's been warm weather but I don't feel the wind and I haven't got hot. For comfort its good and I like the feel of the collar. It is well made. The arms are very long which is better than short. The four external front pockets feel very waterproof but are on the small side. The internal zip pocket and rear outer pocket are much better sizes. The free trousers (not jeans) makes this sound like a great deal however I paid less for a buffalo jacket and trousers before for a lot less - they don't do red! And are of a similar quality. This ARMR jacket probably just has the edge. Very nice jacket, and probably as good as you will get in this price range. Excellent value for money! - good all year jacket, as the inner lining is removable. Seems sturdy and well made. The zippers, as well as all the pockets, are easy to use with gloves on. I'm 6'3 with long flailing limbs and a long back. So naturally finding something to fit is a challenge. I got this jacket in Medium, and its a great fit on and off the bike. The only drawback would be the arms. When I tighten the cuffs around my gloves, the padding makes it look like I have gigantic bingo wings. Length wise they are damn near spot on. Plenty of pockets phone/wallet/disk lock etc. Only used in this tropical weather we currently have, so I can't comment on the watertightness of it. Overall I would recommend this jacket, especially at the price point. I am very satisfied with this jacket. I got old one but the offer was great, jacket and jeans in one price. Perfect quality, nice vision, very comfortable - in one word, great. Bought this jacket for my daily commute to work and as yet really pleased. Fits really well and has not let any water in so far. Particularly like the zips, nice and big and not fiddly like some and the colour is great. You can be seen a long way off, only down side is there is no back plate for protection, had to use one from an old jacket. I bought this jacket and trousers for the second time as I know they offer great protection and can be worn all year round. Good quality jacket, true to size. Inexpensive jacket as good as the big names. I ordered the same size as my last named jacket. Should of got 1 size smaller but hey its just a little big but not a bad thing. Best buy for ages. I got this jacket as it looked bright and had a very reasonable price tag to compliment my leather Gear. What a nice treat.... excellent quality, it fits just as it should and even came with a pair of pants that were quite decent as well. Probably best to go up one size that they recommend as the jacket can be snuggled up to fit the Contours of your body. Nice! I found that, if you stand around in this jacket in a car park drivers come up to you and ask questions about parking. Once on the bike I feel adequately visible and comfortable. The arms are a bit long - but that is probably because I need a big size to encompass my waist. In the few hundred miles I've done so far it has been comfortable, warm and dry. A bargain for the price. For the price it is a good jacket. Recently went over to France it was 30 degrees, because of its construction I wasn't as hot as I thought I would be. Haven't managed to rain test it yet, but I am sure the UK weather will sort it out soon. Amazing jacket good for summer and good for the rain too keeps u warm and when it's hot keeps u cool with the zip opener it has. I bought this as my first riding jacket. Very pleased with the purchase, I've a lot to say so here's bullet pointed pros and cons: Pros: -	Protection offered is good, with abrasion resistant fabric on contact areas. -	Thick foam pads on the shoulders, forearms and knees. These are no D3O armour, but they'll do the job. -	Plenty of high visibility panels around the sides and arms, very important, better to be seen and not knocked off, rather than safe when get hit. -	Slot for a back protector (not included with the jacket, but a suitable one can be found on this site). -	Zip at the base of the back attaches to the Dojo Hara pants that come free with this jacket, to prevent it sliding up your back in a crash, however the elastic material that holds this on would easily tear. 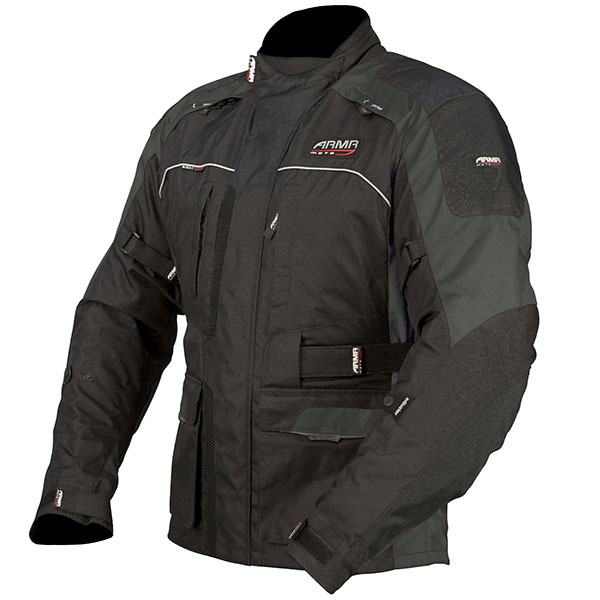 -	Zipper vents on either side of the shoulders and back, which allow good airflow in hot weather. -	Conversely, the wind proofing on the whole jacket is excellent, better than a lot of hiking coats, so you don't get a chill doing 200mph down the M6. -	Pockets: 2 breast pockets, and 4 hip pockets, and an internal breast pocket, all of which have waterproof linings. -	Arm adjustments at wrist and elbow which I keep on the smallest setting because I lack them SICK GAINS YO. -	The sleeves are also long enough, which is unusual because I'm a tall, skinny guy. Cons: -	Thermal lining is pretty crappy, but removable so I probably won't wear unless its very cold. -	First time trying it on, the main zipper came off the top, but easy to put back on. -	One shortcoming is that none there is no headphone wire hole, making it a little tricky to route headphones out the jacket. -	Very little fluorescent material, except for a decal logo on the back. Would definitely recommend this as a good starter jacket, for commuters or casual riders. Probably not ideal if you like cutting up the bends on the track. Good service by Sportsbikeshop, very swift delivery. Bought the jacket as part of special offer including a pair of protective jeans, so very good value. Have worn the Jacket a few times but not in the rain yet. It has many good features, plenty of pockets, air vents, removable lining etc. In both cases the guidance on selecting the correct sizes was perfect, check your measurements against their chart. I love my bike, but hate the cold and the rain. My old gear was starting to let droplets in at seams and down the back of my neck. This jacket has performed brilliantly so far and the free trousers were a bonus. Great value too. Very nice jacket that fits well and seems a very high quality, definitely worth the purchase.